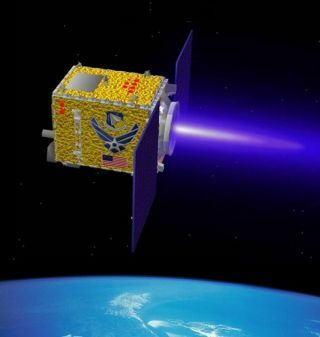 The U.S. Air Force is utilizing a small spacecraft to explore a range of future military applications such as in-space servicing and repair, as well as close-up inspection of satellites in support of future space operations. Rocketed into space on April 11 from Vandenberg Air Force Base, California on a Minotaur booster provided by Orbital Sciences, the XSS-11 (Experimental Satellite System-11) has been busily undergoing a step-by-step system shakeout. The micro-spacecraft tips the scales at roughly 220 pounds (100 kilograms) and is about the size of a dishwasher, with outstretched solar panels. The Air Force Research Laboratory's (AFRL) Space Vehicles Directorate at Kirtland Air Force Base in New Mexico developed the XSS-11. Small, low-cost satellites such as XSS-11 are being tapped to demonstrate key capabilities, from autonomous mission planning, rendezvous and proximity operations to other functions that add to the U.S. military's space toolkit. In showcasing its skills, the XSS-11 is to exhibit the ability to autonomously plan and rendezvous with approved space objects near the satellite's orbit. During its projected year to year-and-a-half mission the satellite will rendezvous with several U.S.-owned objects in its orbit - inactive or dead research satellites or old rocket stages. XSS-11 is now closing in on its first object, a revisit actually, of the Minotaur fourth stage that dropped the spacecraft off in space. "The spacecraft is in very good health," reported Harold "Vern" Baker, AFRL's XSS-11 program manager. "All our sensors at the component level have checked out. Everything is working well." The XSS-11 is circling Earth at some 500-530 miles (800-850 kilometers) altitude. Baker said the ground operators are moving very cautiously and safely. "We are not schedule driven," he told SPACE.com in a phone interview. Thanks to miniaturization of items like communications hardware and cameras, there are a number of missions that can be accomplished via micro-satellite, duties that would have involved much larger spacecraft in the past, he explained. The XSS-11 is headed toward the Minotaur upper stage. The project team is taking incremental box steps to move in closer and closer as they gain more confidence in the spacecraft's performance. At present, visual imager and range sensor equipment on the satellite is being evaluated. "We are staying a good ways away from it [the upper stage]...making sure that everything is performing the way we expect," Baker said. Arrival at the spent rocket stage is likely within the next few weeks, he said. Initially, the XSS-11 is to stay in front of or well behind the object from far away. Then the spacecraft would circumnavigate the stage. The plan is to come within less than a mile to 1.2 miles (1-2 kilometers) of the spent rocket body. Orbiting space hardware that could come into the up-close and personal sights of XSS-11 are other derelict rocket bodies and several old satellites--all U.S.-owned dead or inactive property, Baker emphasized. "We don't call them targets...they are space objects." "It's all based on space safety and making sure we don't run into something. Like I have said many times, if we hit we fail," Baker added. "If we were to bump into anything...there wouldn't be a loss of value to somebody." Clearly, the XSS-11 can be viewed as technologically trial-running military space control objectives. The ability to snuggle up next to an enemy satellite, disable sensors, or even destroy an aggressor's spacecraft could well benefit from XSS-11 lessons learned. "We're a lab. Our job is to demonstrate technologies," Baker responded. The job of XSS-11 is to add another tool to the tool box that military space commanders can consider incorporating, he said. "There are a number of possibilities for servicing, inspection, repair...there's just a wide list," Baker stated. In this regard, the XSS-11 team has been working with officials plotting the future of the Hubble Space Telescope, he said. Lockheed Martin Space Systems Company near Denver, Colorado is studying and developing Hubble servicing and deorbit options. They are also AFRL's structure, propulsion and systems support contractor for XSS-11. How sensors are performing with the XSS-11's guidance, navigation and control system is a key focus of an AFRL ground support complex. Some 30 to 40 people now are carrying out experimental operations with XSS-11. The objective of the program is to get that down to a handful of people, on the order of five individuals, Baker added. "But we have to get through the demonstration first." "This is probably been the best-behaved satellite that I've ever worked on," Baker said. "I mean it's right on the money...a fairly easy satellite to learn." From concept to launch of the XSS-11 was a fast-paced 39 months. Total program cost, including launch and mission operations, is price tagged at about $80 million, Baker explained. When XSS-11's onboard fuel is reading near-empty, he said, the plan is to use the last of the propellant to meet a deorbit criteria. XSS-11 is building upon a predecessor mission, the flight of XSS-10. That spacecraft flew a 20-hour mission in late-January of 2003, inspecting and navigating around the Delta 2 second stage that placed XSS-10 into orbit. Confidence-building use of the XSS-11 during its projected 18-month lifetime, Baker said should allow ground handlers to delegate more and more authority to the spacecraft itself--enabling the craft to fully engage its autonomous planner. "As we go through the mission plan--hopefully, by the end of it--we can take all the go/no-go's out, tell it where we want it to go, what we want it to do, and watch it do it," Baker said. "That's really icing on the cake."